Wu (吳), is the region with the core area around Taihu Lake in Jiangnan (the south of the Yangtze River). Wu region is part of the ancient province Yangzhou in southeast of China. The term "Wu" is the name for several kingdoms based in the area. 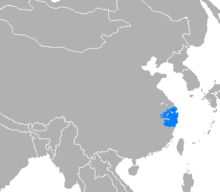 The first Wu state was established in the late Western Zhou Dynasty. Once considered to be a vassal state of the Zhou Dynasty, it emerged as a major power among the various states in China at the end of the Spring and Autumn period. The most influential Wu state was Eastern Wu, which existed during the Three Kingdoms period. In Han dynasty, Wu Prefecture (Wu Jun) was established, and it was part of Yang Commandery (Yang Zhou). Later Wu Commandery (Wu Zhou) was also established. 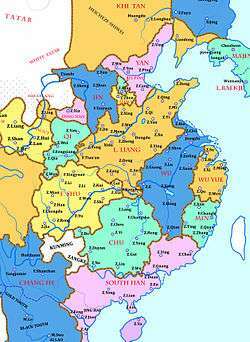 In Sui and Tang dynasties, the names changed several times between Wu and Su and eventually renamed Su Prefecture (Suzhou) in the first year of Qianyuan (CE 758). There was two Wu Zhou during Southern and Northern Dynasties. Wu Zhou in Northern Dynasties was renamed Yang Zhou (Yangzhou) in the 9th year of Kaihuang in Sui dynasty (CE 589), and at the same time Yang Zhou was renamed Jiang Zhou (Nanjing). The state of Wu was originally founded by Taibo and Zhongyong, the first and second son of King Tai of Zhou. Meili (梅里) was the capital city. Suzhou was the capital city of state of Wu during Warring states period. Su Zhou was also called Wu Zhou. The Wu language and its dialects are spoken in Wu region. The city of Suzhou is located in the core area of Wu region, and the dialect spoken in Suzhou is usually regarded as the most typical Wu language dialect. The capital city of Wu state during Three Kingdoms was Nanjing, whose names include Jinling, Jianye and Jiankang. In Eastern Jin dynasty, Nanjing became the capital of China, for the first time the capital of the nation moved to southern area. The previous Chungyuan Standard Pronunciation (中原雅音) evolved into Jinling Standard Pronunciation (金陵雅音) as the standard Chinese. Go-on (呉音), which is one of the sources of Japanese pronunciation for Chinese characters (the others being kan-on, tō-on and kan'yō-on), was Jinling Standard Pronunciation, the standard Chinese of time that spread to Japan during Southern dynasties. The Go- component in the name Go-on is cognate to the Chinese word Wu (Wu is the pronunciation for the glyph 吳 in Mandarin. However, in today's Wu language 呉 is usually pronounced as Ho, Oh, Ng, or Nguu).